Success is achieved by ordinary people with extraordinary determination. This is the story of 15-year-old Thomas Owusu, who is on a journey to make a name for himself with his talent in crafting. 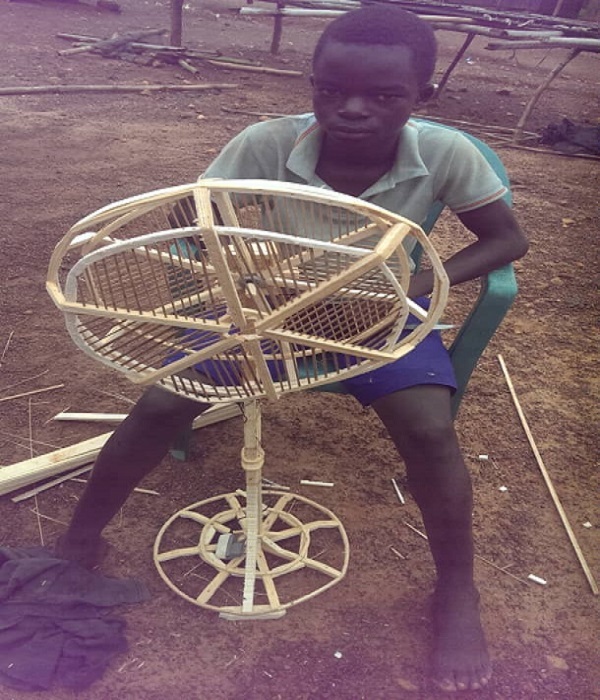 Young Thomas Owusu has put his special set of skills to ingenious use, making a standing fan out of wood and plastic materials that runs on electricity. Thomas is a class 5 pupil of the Bokabo D/A Primary School at Sefwi Bokabo, in the Bodi District of the Western Region of Ghana. Overnight, the extremely talented boy has become an internet sensation, with many commending him for his innovation. Thomas built the entire standing fan in a space of two days, crafting the wood to fit the shape of the fan and moulding the plastic fan blade all by himself. He has already made two of these fans and is hoping to add a few more. Both of Thomas’ parents are cocoa farmers, and he helps them on them farm when he is not in school. In terms of his academics, his teacher says “Thomas is an average student with a strong interest in Mathematics, science and crafting. Pictures of his works were originally posted on social media by his teacher Max Owusu and the post has since been shared over 2900 times, creating huge buzz around the prodigy. Some social media users, impressed with his work, are calling on the government to support young Thomas Owusu to unearth the innovator in him. His teacher tells me, there are also looking out for funding and sponsorship to help Thomas showcase his talent to the world. Thomas has interest in football, but crafting and innovation come first for him and he hopes to become an engineer in future.